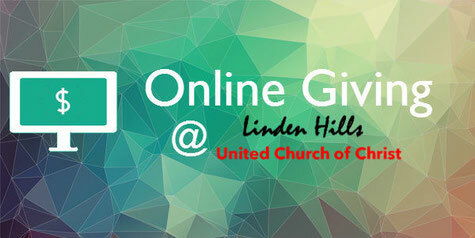 Based on feedback from the congregation, Linden Hills UCC has adopted a platform to support additional methods of giving financial support to the church. LHUCC has chosen Vanco as our platform partner based on their endorsement by the UCC, the positive recommendations from several local churches, and the value the platform provides. If you have been looking for an option to easily set up automatic and recurring donations to the church, now you can. Whereas in the past you may have worried about missing several Sundays due to travel and having to catch-up, now with this platform you can set up automatic and recurring donations to the church. If you host an event at the church and your guests want an easy way to give and show their thanks, now you have a link to share with them. Or perhaps at the end of the year you tend to make a single catch-up payment -- now that is possible on-line. Finally, maybe you are a hoarder of points and want to pay with your credit card...that too is possible (but at a fee to the church). LHUCC has adopted this platform in response to feedback from the church community that not only this would be convenient but would also increase giving. The studies Vanco and its peers in the market have conducted support this notion; the studies illustrate that online giving options have shown to increase total giving by as much as 48%. The convenience and technology of the platform does come with some costs to the church. We pay a flat $50 monthly for access to the service. If you elect to give from your checking or savings account, we only have a $0.35 (thirty-five cents) fee. If you elect to give from your credit/debit card, our fees are more - $0.45 (forty-five cents) fee plus a 2.75% transaction processing fee. So, if you have a choice, please give by the eCheck method by paying from your checking or savings account on the Vanco platform. Thank you for your feedback that made this initiative happen. Please continue to provide your feedback in an ongoing fashion so we can continue to improve your experience and your ability to participate at LHUCC.